The Department of Emergency Services (DES) plays a critical role in keeping Westchester safe. 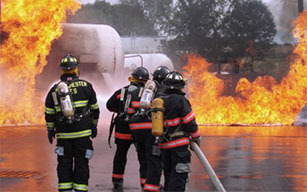 As a part of its complex activities, the department helps local communities by assisting in the coordination of emergency management efforts, providing support with specialized emergency apparatus and other equipment, and offering extensive training opportunities for firefighters, EMT's and other first responders. The Fire District Historical Records reflect the creation and proposed incorporation of several Westchester County Fire Districts, by petition to the Westchester County Board of Supervisors, primarily during the period 1926-1933. The records are organized in alphabetical order by specific town / location. The primary records that make up this collection are the signed petitions submitted to the Board of Supervisors by local residents who were in favor of the creation of the fire districts. In addition, the collection includes official affidavits and notary files; correspondence between local officials with requests for information, such as for tax and land evaluations and tax equalization tables with regard to land purchased for fire houses; and reports and meeting minutes of the Board of Supervisors on the fire district applications. The collection also contains maps of the proposed fire districts in Verplanck in the Town of Cortlandt, Glenville in the Town of Greenburgh and Harmon in the Town of Cortlandt. Two separate folders, dated much later than the rest of the collection, contain information on the job responsibilities and duties of the state of New York regional fire administrator, the New York State fire prevention code, state fire plans; and the other materials pertaining to fire prevention codes.